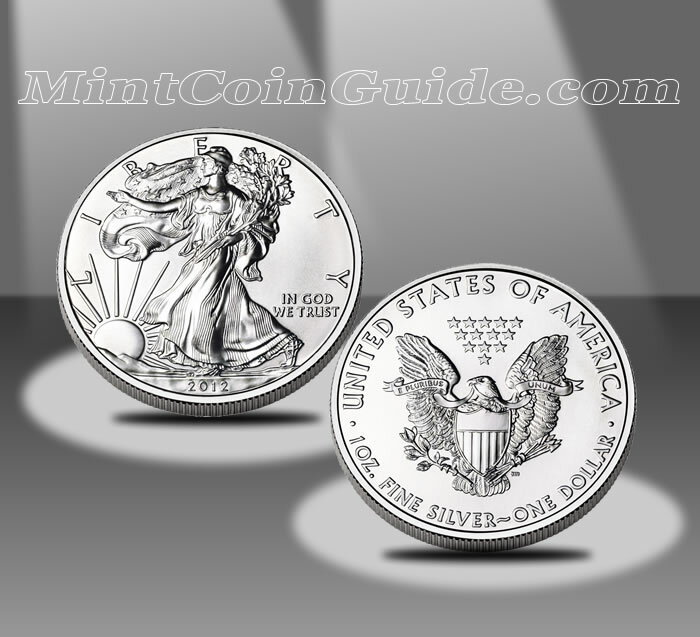 The 2012 America Eagle Silver Bullion Coin was issued by the US Mint as the official silver bullion coin of the United States for 2012. This release marked the continuation of a series dating back to 1986. In that year, the inaugural strikes of the America Silver Eagle Program debuted as authorized by the Liberty Coin Act (Public Law 99-61). Bullion coins of the series are authorized only to be struck from one troy ounce of .999 fine silver. They have a diameter of 40.60 mm and a weight of 31.1 grams with a legal tender face value of $1. The content and purity of each is guaranteed by the government of the United States. Each obverse contains the same "Walking Liberty" design as originally created by Adolph A. Weinman for the 1916 half dollar coin. The design has come to be considered one of the most beautiful ever struck on an American coin. The chart above shows the total number of bullion Silver Eagles sold each year by the US Mint. It does not necessarily indicate the year-dated mintage. US Mint bullion coins are not sold directly to the public. Instead, a network of authorized purchases obtain the coins in bulk, then resells them to the public for a small premium above the current spot price of the one ounce of silver contained in each. 2012 year-dated Silver Eagle Bullion Coins were released for purchase by the authorized purchasers in early January 2012. Eagle bullion coins are sold to the public for a small premium above the current spot price of the ounce of silver in each. Bullion Silver Eagles are typically struck at the US Mint’s facility in West Point (although no mintmarks appear). Other facilities have struck them in the past such as 2011 when the San Francisco facility aided in bullion Silver Eagle production. Adolph A. Weinman’s "Walking Liberty" design is shown on the obverse of the coin. It was first seen on the 1916 half dollar. The reverse (tails side) shows a heraldic Eagle and was designed by John Mercanti.